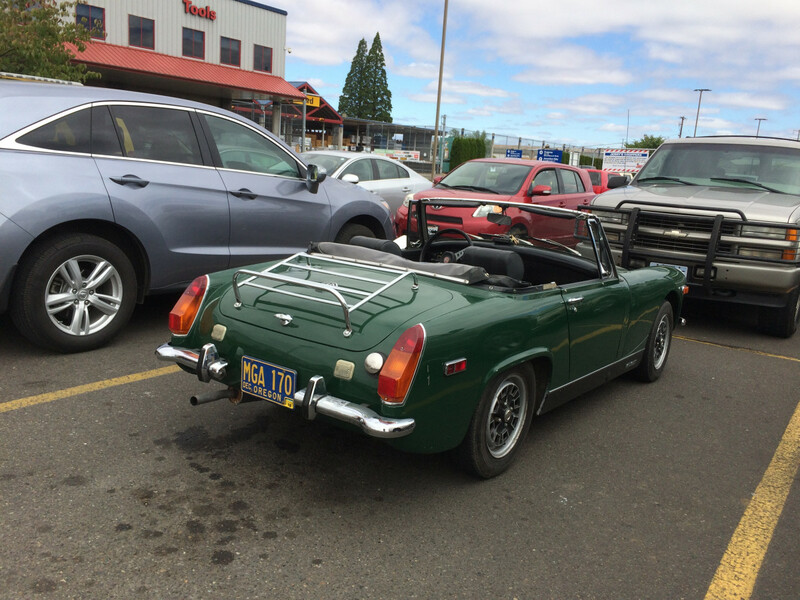 This poor little MG Midget looks a a bit lost and overwhelmed by its neighbors in the parking lot, although it certainly has no problems fitting into the spot with room to spare. But it wasn’t overlooked by me, especially when I saw its license plate. Sporting version of the Morris Minor originally, though that appears to be a late model version, they are very small cars and quite rare here now, MGBs are still fairly common but not the littleun. 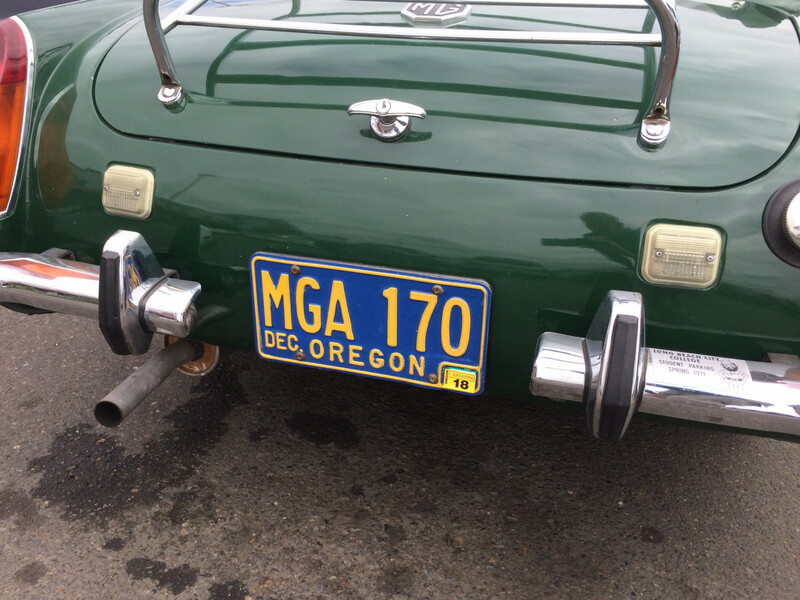 As far as I know, Oregon has a Year of Manufacture license plate law, which permits owners of older cars to register their vehicles with a license plate that matches their car’s year of manufacture. This looks like a 1970-71 MG, and also a license plate from 1970-71. My guess is that the MG’s owner saw a good-condition correct-year license plate for sale somewhere (swap meet, eBay, etc. ), and with that MGA prefix he just couldn’t resist. It’s certainly eye-catching. @Eric703, if that plate were in use as a YOM plate it would carry a 70 or 71 sticker to match the year of the car. The fact that it doesn’t makes it very likely that it’s had those plates since it was new. Having driven a very short distance in a same generation Sprite, I can never understand people that think Miatas are cramped. I can’t imagine what a Bugeye would feel like, assuming it’s even smaller than it’s successor. Basically it’s the Mk.II Sprite so the same in the middle, just restyled each end and with MG grille and badging. Bugeye doesn’t have roll-up windows. There’s more room for elbows in the hollow doors. Otherwise, they’re the same cramped size inside. I have a deep affection for the Midget/Sprite. Some of my first underage driving was in my cousin’s yellow ’69 model in around 1974 or so. I am sure I would find it cramped now but at the age of 15 I found it almost perfect. I’d rather have an MGA, but considering they seem to run about 10X the price of a Spridget that isn’t too likely. Maybe the owner previously had an MGA and traded down to get some cash? God, does that look small and low next to the Chevy and honda (?) SUVs. A fiberglass whip with a flag on it should be mandated for such motorized skateboards. My first sports car was a Sprite. Fun and I learned how to really work on a car. Everything you really need to get from A to B, and absolutely nothing that you don’t. Ah, a carrying case for the Midget. 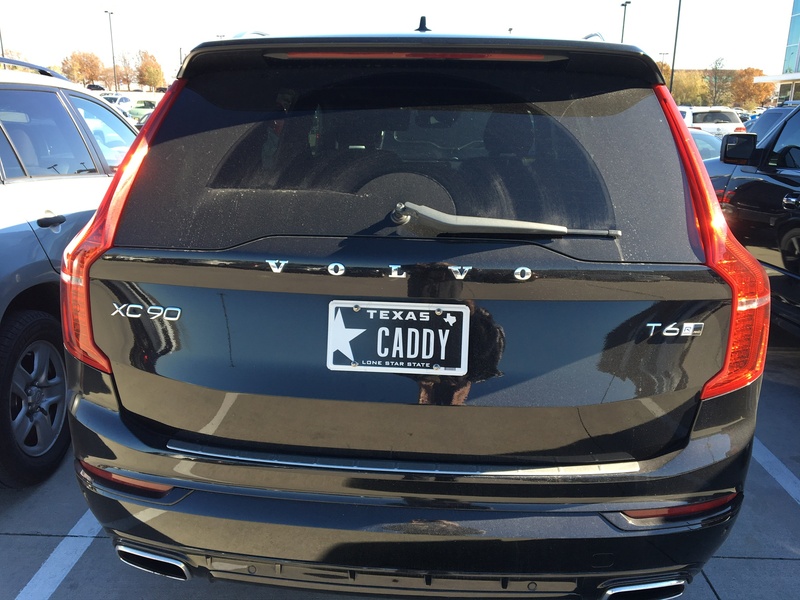 That CADDY plate is a hoot. It reminds me of the white Camaro I used to see locally that had GR8WHTE or something similar on the plate. That plate didn’t look nearly so good when it showed up a couple of years later on a red S-10 pickup. Midgets & Sprites forever ! Had a ’64 Sprite (side-curtains), then a ’67 Midget, in the day …… as daily drivers….. in the snow when necessary …. The things we did without giving a second thought !